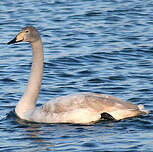 Size is similar to the Mute Swan, but there are noticeable differences. 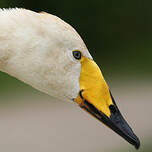 Whooper Swans have a yellow and black beak, a more rigid neck bearing in activiy as well as at rest, and, finally, their wings produce a musical sound when they fly. Their feathers are entirely white and their webbed feet are black. 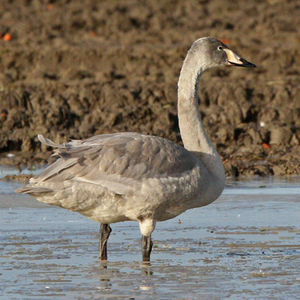 Juveniles show a greyish brown plumage. After one year, they get their adult one. 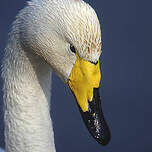 The Whooper Swan can also be mistaken for the Bewick Swan whose he's very close. 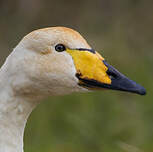 There are two ways to differentiate them: the Whooper Swan is much bigger, with a longer neck and a more angulous head, and the beak's yellow/black layout is different. 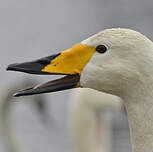 While the Whooper's Swan beak looks globally yellow with just a black tip, the Bewick's Swan's one is mainly black with a yellow base, sometimes half yellow, half black. 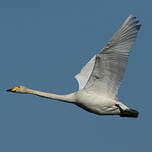 Unlike the Mute Swan, it never raises its wings above its back when it swims and its neck is straighter. 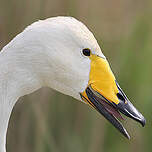 The Whooper Swan emits a loud 'whoop-whoop' call, sounding like a trumpet. 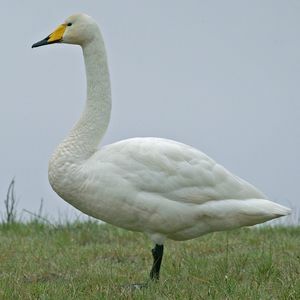 It's the most noisy swan and his name has been given because of its singing variations. 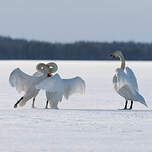 Their soft and modulated singing resound like the husky sound of a distant bell. Their singing melodies are made of 6 or 7 rising and descending notes. 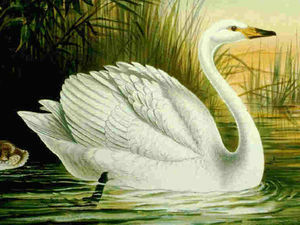 The swan singing inspired numerous composers and philosophers who often transposed it as a farewell. 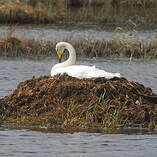 Whooper Swans nest mainly in Eurasian boreal regions. They split in three distinct groups. The most occidental one, with a stable population of about 16 000 individuals, nests in Iceland. The central one nests in Scandinavia and Occidental Russia. It is estimated at 59 000 individuals, regularly increasing. The most oriental group is located in Siberia. Its population, estimated at 17 000 individuals, is probably decreasing. These groups migrate south beginning autumn with the first cold days. The occidental group leaves Iceland for the British Isles, North Sea and Channel coasts, as far as the farthest point of Brittany. The oriental group sets up on Caspian and Black Sea shores. 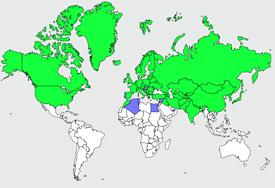 The Scandinavian group is the one that has the shortest migration. 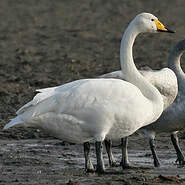 During winter, Whooper Swans, like Bewick Swans, spend a great deal of time grazing. In its nidification aera, it frequents steppe lakes shallow waters, natural reservoirs and tundra ponds. 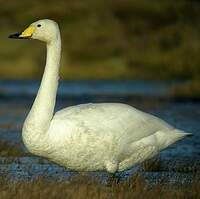 In winter, Whooper Swans can be more often found in agricultural plains, close to the coast or more inside in liable to flooding plains. 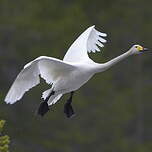 Whooper Swans are less nimble than their cousins when they take flight and they land. They slip longer on the water. They fly off loudly by running on the water. On the contrary, their flight is very silent. Essentially vegetarian. It eats aquatic plants and uses all parts of it (stems, leaves, roots, shoots). It also graze in prairies, like geese. It may eat small invertebrates, but it's a minor part of their diet. Pairs unite for lifetime. 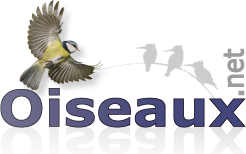 Males are very active in nest building. Their nest is bulky and made essentially with stems and leaves. The bottom is covered with twigs, leaves and feathers. 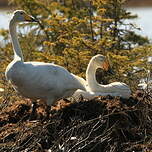 In April-May, the female lays 4 to 7 eggs and sits on for 5 to 6 weeks. Chicks are precocious and are carried on the female's back under the male's aggressive watch and protection. Taking flight occurs 87 to 90 days after hatching. They are threatened by trouble, alteration of their habitat, illegal hunting, lead pollution, and agricultural chemicals. 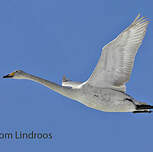 High voltage lines don't seem to affect Whooper Swan's populations.